Yesterday marked the so called completion of the prisoner swap agreement, which commenced on October 18, 2011, when Gilad Shalit was released for a total of 1,027 Palestinians to be released from Israeli prisons in two separate waves. Yet it must be noted that the numbers do not change any of the ideology or tactics employed by the occupying Israeli entity that continues to suffocate Palestinian security and livelihood. On October 18, 2011 Palestinians eagerly awaited for the release of their loved ones from Israeli prisons, some of whom spent decades behind the cold walls of Israeli occupation facilities. Many were “exiled” from the West Bank, where their families reside, and others were let “free” in the open air prison of Gaza. 477 Palestinians were released from prison on October 18 after Israel had shot tear gas canisters at the families who waited for their loved ones to come home. Yesterday Israeli troops began to shoot tear gas canisters in Ofer at those waiting for their loved ones to be released during the second and final phase of the prisoner swap deal. This was not about fairness if chemicals were shot to force rejoicing people to cry and choke. A savage group of armed Israeli jailers broke into section 10 of Eichel prison and attacked prisoners aggressively. 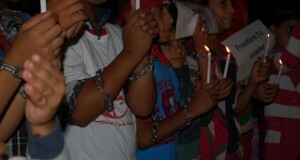 They sprayed tear gas and pepper powder into the detainees, which resulted in several injuries and cases of suffocation. They summoned additional military units to break into all 13 rooms of the section. Adding more savagery, they confiscated all the detainees’ possessions, dragging away TV, fans, banning them from the cafeteria, and cutting off electricity and water, leaving Eichel Prison isolated from the outer world. In a publication released by Addameer, the Prisoner Support and Human Rights Association, it notes that following the first phase of the prisoner swap deal until December 12, an additional 470 Palestinians were arrested by Israel. 477 prisoners were released by Israel, 470 other Palestinians arrested–Israel did a mere substitution. Yesterday 550 were released by Israel, and one can only expect that Israel will again substitute these for others. It is an industry. 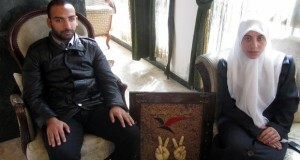 Through the application of simple subtraction, Israel afforded Palestinians 7 released prisoners during the first phase, and time will tell how many Palestinians will be arrested following the conclusion of the prisoner swap deal. While the application of mathematics onto the strategy of a colonial enterprise seems like an irresponsible stretch, a study of its occupation tactics may quickly conclude that Israel is obviously targeting Palestinians, yet draws fancy numbers ahead of its Zionist policies. In utilizing a number game, Israel overlooks the individual narratives and cases of each Palestinian individual arrested or released from detainment. Israel overlooks the diversity of Palestinians, their situations as individuals, and the surrounding details regarding each individual. This does not matter to Israel; if it did, it would not sweep up Palestinians at random or during peaceful demonstrations. The number game reduces Palestinians to just that, numbers, smudging the humanization of each Palestinian individual as Israel struggles to address the equation of Palestinian existence. The Palestine Monitor notes that since 1967, over 700,000 Palestinians have been detained by Israel, equaling 20% of the total population of Palestinians still within the occupied territories. The numerically marked Military Orders that Israel instills are used to justify the arrest of anyone, whether they are holding a Palestinian flag or coming home from school. And most of the time, the Military Order is unknown to Palestinians until after they have been arrested. Sometimes there is no need for a reason to be arrested, as Palestinians can be detained without a charge for months on end. Numbers are put ahead of these racist orders. Yet they still remain racist. Numbers are put ahead of the innocent prisoner, whether it is Ashraf Abu Rahmeh counting his days in a kangaroo court or the Tamimis counting the amount of times they had to be dragged off. Numbers count the amount of trees ripped from the soil by price tag fanatics, numbers count refugees, numbers count what international aid amounts to, numbers tell the world how many years Palestinians have been illegally occupied and expelled from their indigenous homeland. Numbers mark the days of a hunger strike within Israeli prisons by Palestinians starving for justice- numbers are the days it takes for the world to notice. Numbers can be distracting. But they have no meaning when everyone can be a target of Zionist policy if they stand in its way. When simplifying it and reducing the variables, the common denominator is Illegal Occupation. As Israel concluded the release of 1,027 prisoners, it announced that it will construct 1,028 housing units to spread its colonial settlements. Israel is outdoing itself again to cause more tension.